HDR photography sure looks impressive, but to make one might be easier than you think. 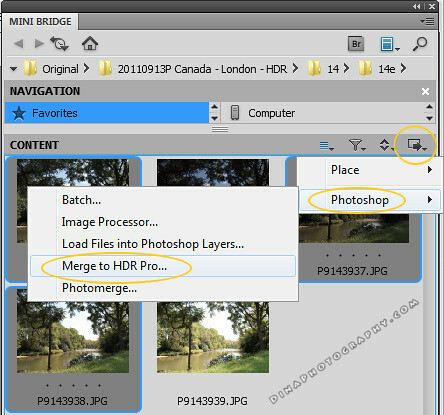 You only need to have 3 photos of the same scene with different brightness (exposure value), and then combine the 3 using HDR software to create the final HDR-style image. From the previous tutorial, you know how to take the 3 photos of different brightness needed. 4. See the “preset” drop down menu in the top right? Check it out and play around with the presets, see which one you like. For my photo set, “more saturated” option looks good. 5. Or, do you want to try my magic “Dina Sliders“? Remove ghost (on top): try on and off. See which one you like. 6. If you are not satisfied with the preexisting presets, choose the closest one, and play around with the adjustment sliders. Later on in a more advanced tutorial, I’ll explain to you what those sliders are for exactly. 7. Happy with the appearance? Click OK button in the bottom right. 8. 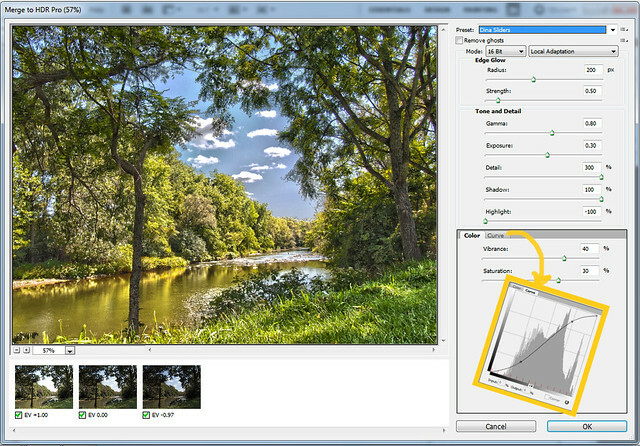 Now the resulted HDR picture will appear in the regular photoshop window. 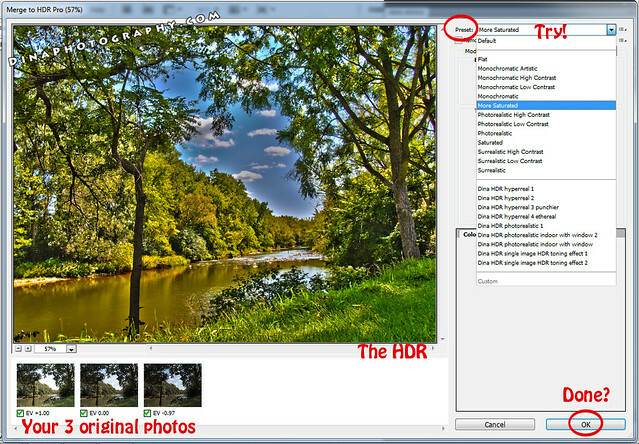 To actually save your HDR picture, make sure you hit the save as button!! You can save it as jpg file (or else if you wish). 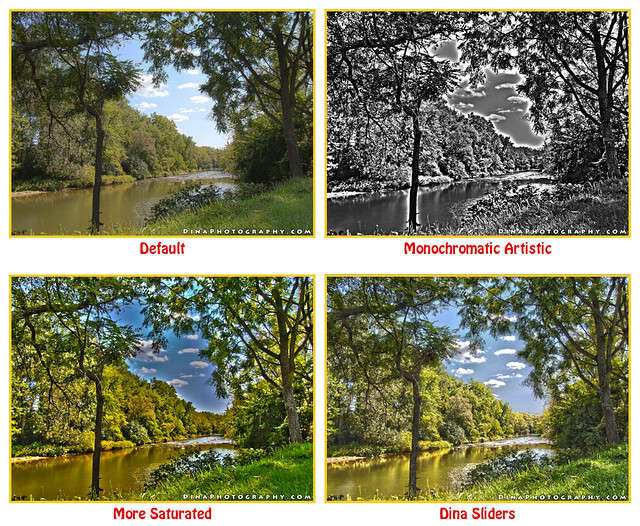 Do you like your new parameters ans want to keep it to create your next HDR images? You can save it! Easy, right? Now, have fun creating your own amazing HDR photograph! Also check out my HDR galleries here! 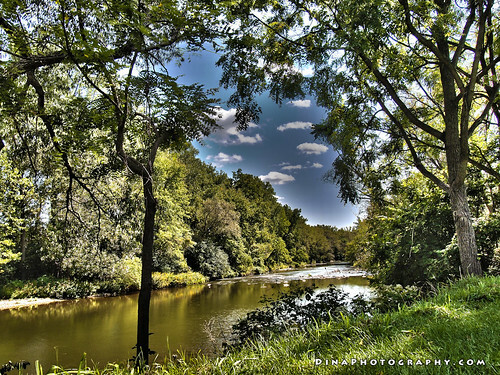 HDR Photography: What is it?